One cup of coarse bread crumbs, one-half cup of milk, one-fourth cup of flour, one-fourth teaspoonful of baking powder, one-half teaspoonful of fat (butter or lard), one teaspoonful of beaten egg. Pour the cold milk over the crumbs and let soak until soft, then press through a puree sieve. Add the flour, salt, shortening and egg and beat well with the spoon, then add the baking powder in a teaspoonful of saved-out flour. If sour milk is used, add one-fourth teaspoonful of soda instead of baking powder with the teaspoonful of flour. Sauce for reheating dark meats: Sweet corn, strained tomatoes, and clear soup in equal quantities form a basis for a brown sauce for reheating dark meats. Strain sauce before using, then cut into it hard-boiled eggs, as liked. Thicken the sauce as for creamed potatoes. One cup of strained tomato, one tablespoonful butter, one tablespoonful flour. Heat the butter and flour together, pour in the cold tomatoes, and cook four or five minutes. One-fourth cup of whole milk, one teaspoonful of flour, two teaspoonfuls of butter. Make sauce of these, and season to taste with salt and pepper. One-fourth cup of chicken or veal cut in small dice, one-eighth cup of cooked egg (left over in whatever manner cooked), cut equally fine, one-eighth of a cup of cooked rice. Add to the sauce, boil up, and serve on dipped toast. Two tablespoonfuls of horseradish, two tablespoonfuls of fine bread crumbs, one tablespoonful of vinegar. Heat all together, and season with salt and pepper. Best mustard, one and one-half level tablespoonfuls; sugar, one level tablespoonful; salt, one-half teaspoonful; vinegar, one-fourth cup; butter, one teaspoonful. Mix ingredients, and cook until it thickens, then add the yolk of one egg, well beaten, cool, and use. Pick the chicken from the bones and cut into small pieces. Make a sauce by using half chicken broth and half sweet milk thickened with flour. Make a crust same as for shortcake, line the baking dish with the crust, fill with paper, lay the upper crust on and bake; when done, remove the top crust and take out J;he paper. Fill the crust with hot chicken and sauce, replace the top crust, and serve. One-fourth cup of chicken cut in pieces as desired, one-fourth cup of milk and one-half cup of broth, thickened with two teaspoonfuls of flour mixed with two teaspoon-fuls of milk, cook until it thickens, season with salt and a very little pepper, put in the chicken, let come to a boil, and fill the crust. Small children enjoy things which are out of the usual in form, size and color. The refreshments for a children's party should be simple, but attractive and palatable. They should consist of such things as are least liable to disturb the digestion, for children exercise little discrimination in eating. Oranges peeled, divided into the natural divisions and served in orange baskets, or orange cups, afford the child far more pleasure than do oranges in their natural form. A bird or animal cooky is much better, to their taste, than a common, round one. Sandwiches made of bread cut very thin and buttered, with a lettuce leaf laid between the slices so that its green color shows through the thin slices and its curly edge shows on the border are attractive and wholesome. With the aid of a biscuit cutter one can make sandwich moons and crescents with little trouble and waste. A kitchen knife is the only tool necessary to enable one to make sandwiches in the form of stars, diamonds, triangles, etc. 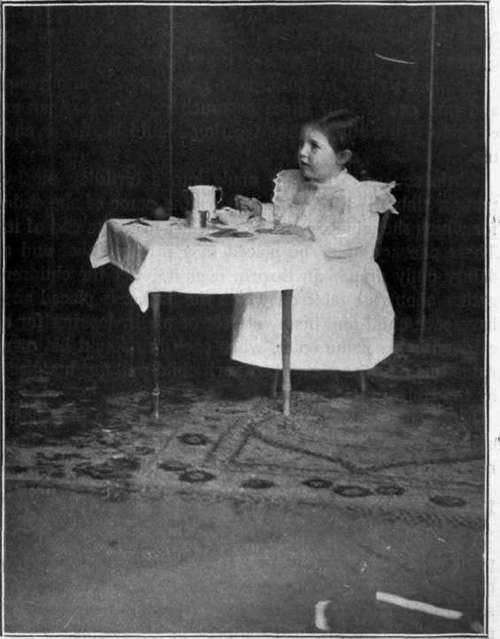 The child enjoys a sandwich made of buttered bread with chopped nuts between. Either angel cake or sponge cake is more wholesome than butter cake, and can be made equally attractive by frosting and decorating as desired. Simply a white frosting with the name and age, or the birth date in colored letters, pleases the small child. This may be done by tracing the letters with a colored frosting, or with small colored candies. Butter cake mixtures may be baked in tiny pans and dipped in frosting. Cookies and ginger snaps may be cut in fancy shapes and decorated with colored frostings. Those who object to using the colors sold as vegetable colorings and used for tinting candies, frostings, etc., can easily make a sufficient variety of colorings at home. Green coloring can be made by tying spinach leaves loosely in cheese cloth, placing the package in a vegetable ricer and squeezing. After the juice is boiled to the consistency of syrup it is ready for use. Pink coloring may be obtained by boiling a mature beet, being sure that the skin is not broken in any part and leaving the top on. When done, rub the skin off in cold water, cut the beet into bits, put through a vegetable ricer and then through cheese cloth, and use same as spinach coloring. To make yellow frosting, put a raw egg yolk into a cup and put into it four times as much powdered sugar as egg and beat until thick as frosting should be, flavor and use. Little souvenirs may be made into a birthday pie by tying a ribbon with a card bearing the name of the child for which the trinket is intended attached to the end of it. These packages may be placed in a pretty basket and a dainty doily or napkin thrown over it. Let the children gather about the table on which the basket is placed and have each child find his own piece of pie by looking for a card with his name on it, when each has found his own name uncover the pie and let each child pull out his piece by the ribbon attached. Little children find pleasure also in having a play post-office behind a screen in a corner of the room, where they may go and ask for their special parcel.